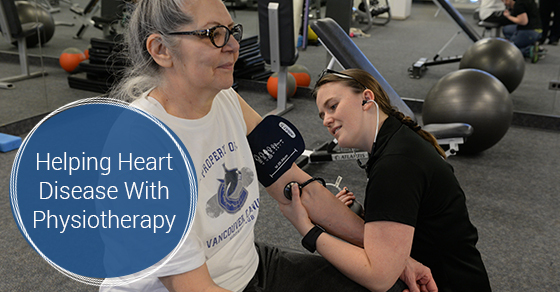 How Physiotherapy Helps With Heart Disease | Dynamic Physiotherapy & Sports Injury Clinic Inc.
We’ve all experienced heartache, but some of us have experienced it in a literal sense. The term “heart disease” is sometimes used to mean “cardiovascular disease”, which usually describes heart conditions that involve the narrowing or blockage of blood vessels that may cause a heart attack, angina (chest pain) or stroke. Other maladies of the heart include irregular heartbeat and mitral valve prolapse. Cardiac disease is a leading cause of death in Canada. About 90 per cent of Canadians have at least one heart disease risk factor. There are things you can do for your ticker that can help it to function at its fullest and best capacity and one of those things is physiotherapy. Physiotherapy-led cardiac rehabilitation (CR) can reduce the risk of death due to heart problems, can increase overall good health and quality of life, reduce time spent in hospital due to cardiac issues and lessen the number of hospital visits due to heart problems. Working with a physiotherapist in a CR program may improve positive patient outcomes. Physiotherapists are involved in the process of hospital to outpatient care services improving the patient experience in care after a cardiac episode. CR after having a heart attack is an ongoing process over months, and perhaps longer. Part of the overall rehab plan is working with your physiotherapist to come up with a number of relaxation techniques to reduce stress and exercises that will make your legs and core muscles stronger. Any physical activity like walking will be gentle at first. This will build physical endurance and build confidence. As you and your heart become stronger, gentle aerobic exercise may be introduced, which decreases heart rate and resting blood pressure. Exercising regularly will improve your muscles and help you use oxygen more efficiently. The professional team at Dynamic Physiotherapy & Sports Injury Clinic will work with you to develop a plan that takes into account your personal situation, including the severity of cardiac disease, your lifestyle and age. They have vast experience in helping patients manage heart disease and will advise and guide you through your CR program. Make an appointment with them today to get on the road to better health.